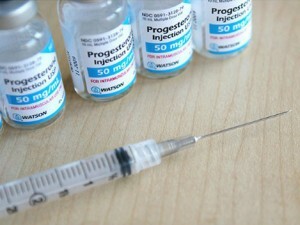 Progesterone is a female hormone that has a wide variety of uses in gynecology. While the drug is generally considered safe, there are several side effects that patients should be aware of. Among the most serious of these are muscle pain and tenderness, severe headaches, stomach pain and sudden shortness of breath. While these side effects are usually very mild and go away on their own during treatment, patients should always report them to their physicians if they persist for long periods of time or become increasingly bothersome. The incidence of these side effects can be avoided by taking the lowest dose of Progesterone that treats the symptoms for the shortest amount of time possible. These side effects are very serious and can be life threatening if not treated immediately. If patients experience any signs of an allergic reaction including hives, itching, swelling of the face or difficulty breathing, they should seek immediate medical treatment by visiting an emergency room or calling for medical help. Failure to report any of these conditions or activities to physicians can result in serious side effects that can become life-threatening very quickly. Physicians will work with patients who have experienced any of these conditions to find the best course of treatment that will adequately treat the disorder without causing any undue harm. In order to reduce the occurrence of side effects, the medication is not intended for women who have a history of abnormal vaginal bleeding, breast cancer, liver disease, a history of strokes or who are currently pregnant. Progesterone is a short-course drug, meaning it is generally only prescribed for periods of six to 12 days during each menstrual cycle. This reduces the number of side effects experienced and therefore reduces the risk of life-threatening illnesses. In order for the medication to be effective, women should follow their dosing schedules exactly as prescribed as closely as possible. Progesterone should be used with caution in elderly patients due to the increased likelihood of serious side effects including liver failure, stroke and heart attack. Some studies have shown that low-dose Progesterone treatments given over a long period of time may in fact boost the mental capabilities of elderly patients who suffer from dementia. Regardless of the reason or illness, Prometrium should only be prescribed to elderly patients when the benefits of the medication clearly outweigh the risks to the patients’ health. Both patients and their caregivers should constantly monitor for serious side effects of Progesterone. Although Progesterone and Promethium have the capability to completely transform many women’s quality of life, this medication is certainly not without its pitfalls. Anyone using Progesterone should monitor their health very closely and report any serious side effects to their physicians immediately.